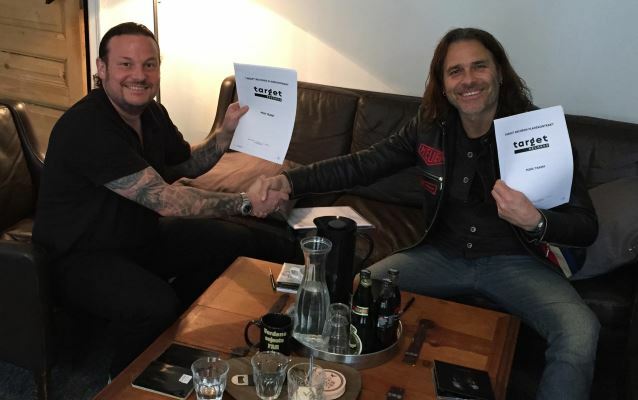 Target Records has announced a new worldwide deal with former WHITE LION singer Mike Tramp. Mike returned home yesterday to sign the contract with Target Group CEO Michael H. Andersen. Tramp's new album will be released in August. The follow-up to last year's critically acclaimed "Museum" will be Mike's fourth release for Target. Mike earlier this week once again squashed any rumors of a WHITE LION reunion, claiming guitarist Vito Bratta had no desire to play music. "A WHITE LION reunion is impossible," Mike told the Jakarta Globe. "Bratta has shown a negative response [to the idea]. He stopped playing guitar, stopped recording; he is just not interested in music anymore." Tramp's last attempt to revive WHITE LION resulted in the 2008 album "Return Of The Pride" with new members Jamie Law on guitar, bassist Claus Langeskov, drummer Troy Patrick Farrell and Henning Wanner on keyboards. "I really love the album but it's just not the sound of WHITE LION," Tramp told Hot Metal back in 2012. "I never really wanted to record under the name of WHITE LION again because so much of the sound and the songwriting came between Vito and I. "Writing a new album is not sitting there and baking bread. The idea has to come to you. That works well when it's Mike Tramp writing new songs. But WHITE LION has restrictions. It's known for an image, for a sound and so on. You're limited already and that's tough when you go in to do that. I don't want to be that as a songwriter. Then it becomes a pre-fabricated product, then you get KISS. That's not what I want to do in this case." "There's a big difference between going up and playing classic WHITE LION songs and presenting new WHITE LION songs. WHITE LION isn't there. The sound of WHITE LION when it came to songwriting was Vito Bratta and Mike Tramp. That can't be changed and that will never happen again."